Hiking season is right around the corner, so to celebrate Oregon Wild is hosting William Sullivan for a brew pub presentation, "New & Endangered Hikes Around Crater Lake." Free and open to the public! Have you explored the upper reaches of the Rogue River? Or climbed the wild forests and volcanic peak of Mount Thielsen? Join us as we go on an adventure in and around our only National Park with Oregon's own William Sullivan. William L. Sullivan is the author of eighteen books and numerous articles about Oregon, including a "Oregon Trails" feature column for the Eugene Register Guard and the Salem Statesman-Journal. He is best known for his hiking guidebooks -- and yes, he has hiked every trail he could find in the state. Join us as William L. Sullivan shares his explorations and adventures around Oregon's only national park, Crater Lake. 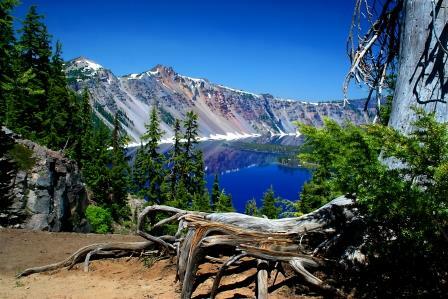 What: Oregon Wild Thursday: “New & Endangered Hikes at Crater Lake and Beyond”, with William Sullivan. Free and open to all ages. WIN! : Everyone who attends this free event can enter Oregon Wild’s free raffle for great prizes like Columbia Sportswear gear, Oregon Wild swag, and more! You must be present to win. The Crater Lake region boasts lush ancient forests, watersheds to five iconic Oregon rivers, and home to many threatened and endangered species. The Crater Lake region is so much more than a park. Join us as we explore new and endangered hikes around Oregon's crown jewel, and start planning your summer advenutres!